We first introduced Aroy-D red curry, followed by Tom Yum, and customers have told us how much they like both. 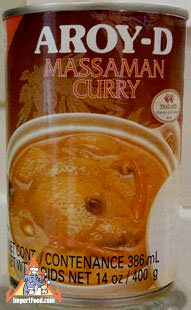 Now we have the same in Massaman flavor, currently shipping Por Kwan brand, not Aroy-D as shown. Each can of massaman soup has everything you need to enjoy an authentic Thai meal, including potato. It's simply "heat and serve" but there are instructions on the can. Add chicken (or beef) if you prefer, during the cooking process. Cook and serve with jasmine rice. See our recipe for massaman chicken, made from scratch. Ingredients: coconut milk, bamboo shoots, masaman curry paste (onion, salt, galangal, chili, lemongrass, coriander, garlic, cumin, nutmeg, kaffir lime peel, pepper, cardamom), potato, sugar, salt, modified corn starch, caramel color. No preservatives. Product of Thailand.